a. Remove Floor Plate and Shift Lever (fig. 5). 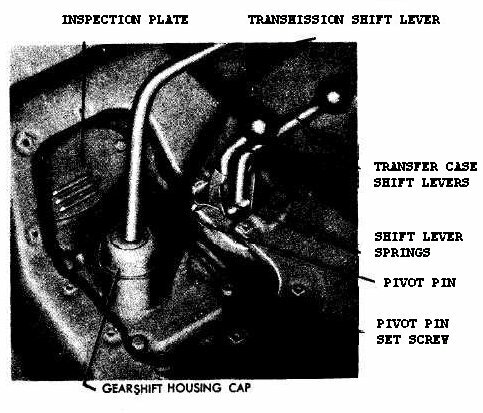 Remove the cap screws from the floor plate at the transmission, and remove the floor plate.Remove the gearshift housing cap and remove the shift lever from the transmission. Removethe set screw that secures the shift lever pivot pin on the transfer case and, with a suitable drift,remove the shift lever pivot pin. Remove the two shift levers and shift lever springs from thetransfer case. Remove the two cap screws that secure the clutch housing inspection plateand remove the inspection plate.